When I was a child, my Dad told me that during his Army training as a paratrooper in Israel, they often went on long multi-day hikes. He told me that they slept only two to three hours per night, without a blanket or a sleeping bag, to prepare them for real combat situations. He added that they hiked carrying heavy equipment and that they walked so long, that he was perpetually sleep deprived for days. He said that he was so sleepy, that he often slept WHILE he walked. I asked him with suspicion how could he possibly sleep while hiking, and he told me that he was so tired, that all he needed to do was to close his eyes and he would fall asleep. In order to do that, he would ask his army buddy walking ahead of him, if he could put his hand on his shoulder to use as a guide, and he would fall sleep walking for twenty minutes at a time. It sounded amazing to my child’s mind, if not impossible. Of course I had heard about sleepwalking, but this was different, this was a fully conscious choice to fall asleep while hiking WITH heavy equipment on his back. All of my life I’ve remembered my Dad’s story, but for the first time in my life I have reached a point during this pilgrimage, where I could fully understand what he spoke of. It seems as if the body is capable of moving forwards on its own volition, even without my conscious mind’s participation. Today was the third day in which I walked while feeling sick. My throat hurt and I alternated between feeling feverish and sweaty, or shivering and cold. We started the day with an outline of a plan, and decided to visit as little or as many temples as I could manage. The minimum we decided to walk would be to the three temples located around the city of Imabari. Walking between temples 54, 55, 56 and then back to the train station, amounted to only 12 kilometers, but because I felt that I was doing well, I decided to push it farther and walk more. Temple 57 was at the top of a hill, but I was still feeling strong, so we hiked onwards to temple 58. Temple 58 was on the top of a very steep hill and while walking in the sun, I felt tired and feverish. The Henro path then climbed into a forest, with hundreds of steps up a steep slope, and it was dark, cool and damp. The path was very wet with runoffs from the recent days of rain, and an overflow from a nearby waterfall. It was getting late in the afternoon and we had to get to the temple before it closed, at 5PM. I was shivering from cold since my pilgrim’s jacket was soaking wet from sweat. The path was lined with sculptures of Buddhas and protectors, and I felt as if they were urging me on….To push beyond this perceived sickness and not to give in to it…. We made it to the top of the mountain and to the temple on time. After our prayers and getting our pilgrim’s book stamped, we still had to hike down the forest path for about 7 kilometers to the train station that would take us back to our hotel. On the path that we walked today, there were no places to sit and eat, only a convenience store or two, and we did not want to make a detour, because we were hoping to walk as much as we could before 5 PM. During the day, I wasn’t that hungry and my throat was still hurting, but I was sure that Jules must have been hungry, and just not complaining. I had had a great breakfast of a big salad, juice, yogurt and two mini chocolate croissants, and after breakfast we walked to the nearby Starbucks in Matsuyama and had an Earl Grey tea with soy milk and honey. But breakfast was a long time ago and we’d walked since for many kilometers…. On top of the mountain before walking down towards the train station, we had a small bag of peanuts which we shared. I walked in a daze, thinking that I could easily close my eyes and sleep as we walked…. Just like my Dad did so many years ago…. It was already dinner time when we reached the city spreading wide below us. We decided to stop at a brand new Mos Burger, the only restaurant in sight, to see if they had anything we could eat, since we knew that the local train would only be coming once an hour and so it would take awhile to get to our hotel. It was the first time that we had ever entered this Japanese version of a fast food burger chain. We ordered a veggie burger with Avocado, lettuce and tomato and a small side of chips. Jules adds: “Right after we finished our Mos Burger culinary adventure, we started walking towards the nearby train station. Tali was walking ahead of me when suddenly she appeared to stumble, bending forward and lurching a little to keep her balance. For an instant, I didn’t think much of it, but then she called out to me to come and hold on to her. She had gotten dizzy and nauseous, and almost passed out. Fortunately, when I held her, she regained her equilibrium, and could continue to walk to the station. It was a sure sign that we had overdone it today, considering that Tali was still not feeling very well. I’m hoping that a rest day here in Imabari will help Tali to regain her physical and mental strength, and to recover her usual strong and happy attitude towards the remaining time we have on our pilgrimage. Temple 54, Enmeiji – known as the Temple of Long Life. It is located in the hills of Imabari. It was founded by Gyōgi and later restored by Kōbō Daishi at the request of Emperor Saga. Originally, it was located on the top of Mt. Chikami but, as with other temples, it was burned down during wartime and then rebuilt in its present location in the year 1727. Legends say that one of the bells of this temple was once taken to be placed in Matsuyama Castle. However, it started to ring without anyone touching it, making a sound that sounded like the word “Home,” as if it was asking to be returned to temple 54. So it was promptly returned to the temple. Temple 55 Nankōbō, is known as the Temple of Southern Lights. It was founded in the 8th century by Gyōgi. When it was founded, it was associated with the Shintō Shrine of Omishima Island. In the 9th century, Shintō Kamis (gods) were considered to be manifestations of Avatars, or reincarnations of Buddhas and Bodhisattvas. It was because of this theory that many of the Buddhist temples along this pilgrimage stand on the same grounds as Shinto shrines. Ceremonies at the shrines and temples were usually combined, and worshiped side by side by the same congregation. This lasted until the early years of the Meiji Period when they were legally separated by royal decree. Shinto was established as the state religion, and Buddhism was persecuted. This temple was destroyed in the 16th century, and then later restored on a smaller scale. Allied bombings in 1945 destroyed everything except the Daishidō (hall of Kobo Daishi) and the Konpira Shrine. Later the temple was rebuilt again. The monk at the office was very sweet and friendly to us, but all he knew about New Zealand is that the capitol is Wellington. Temple 56, Taisanji, is known as Peace Mountain Temple. The temple was built by Kōbō Daishi and was once located on the top of the mountain. In the year 824 it was renamed Peace Mountain Temple because the emperor came to pray there. Later the temple was rebuilt on the slopes of the mountain and not on the top. The Sōja River that runs near here, has often flooded the neighboring villages and caused great damage and loss of life. In fact, even today, after all the rain we have gotten in the last month, the river runs very high, and all the canals we pass are nearly overflowing. At the request of the local people, Kōbō Daishi tamed the river by performing a secret ritual on its banks, at which time Jizō Bosatsu appeared. 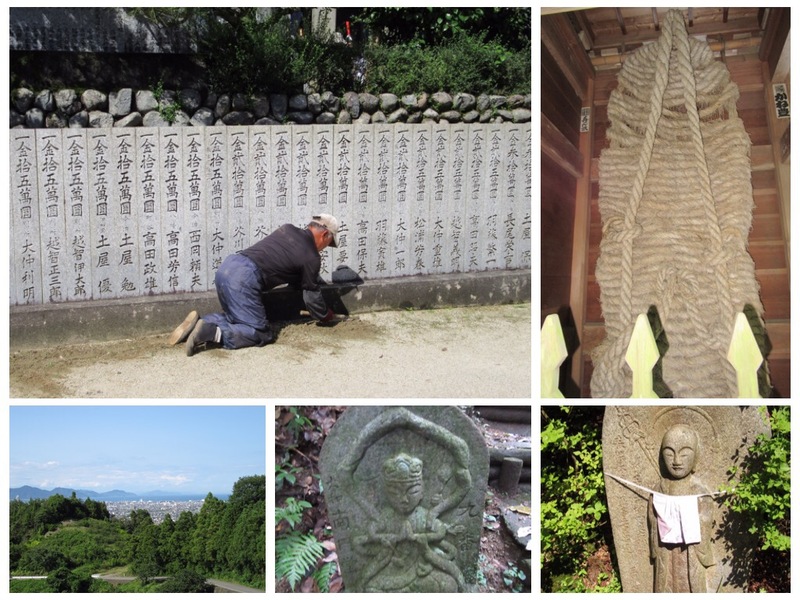 He then built the river’s levee, carved a statue of Jizō, and enshrined it in the temple. As we left the temple, the guide of a big bus of Henros who had been chanting in unison, came over to me and gave me an Osettai of money to buy juice or drinks. I thanked him very much and indeed we bought ice cold tea after we left. Temple 57, Eifukuji, is known as the Temple of Good Luck. The temple was founded by Kōbō Daishi on the orders of Emperor Saga. The location had a Shintō Shrine when Kōbō Daishi first prayed here for safety at sea for the local fishermen. Legends say that his prayers worked, and that he was able to stop a storm with his prayers. Amida Nyorai appeared to Kōbō Daishi who then built a temple, and carved a honzon (Buddhist holy image) of Amida, and enshrined it here. Temple 58, Senyūji, is known as the Temple of the Wandering Hermit Sage. It was built on the orders of Emperor Tenchi by the local ruler in the 7th century. Legend states that the hermit (Sennin) ascetic Abō, recited sutras here for forty years before mysteriously disappearing one morning. The Honzon (effigy of the temple’s main deity that is usually enshrined in the inner sanctum) was carved by a pious local girl. According to another legend, the Honzon was brought up by a Dragon from the depth of the sea. Kōbō Daishi made this the 58th temple on the pilgrimage and the Dōjō of esoteric discipline. Local people call this temple, “Osarei” (carving while prostrating yourself), because the girl who carved it, prostrated herself once after every cut of the knife while she was carving the honzon. The temple is located at an elevation of 1, 300 ft, on the top of the mountain. Along the path to the temple, there are thirty-three statues of Kannon, the goddess of Mercy.